I remember when I went to Las Vegas a number of years ago and tried the wagyu at an awesome restaurant in the Wynn Hotel, I just wanted to melt with it. 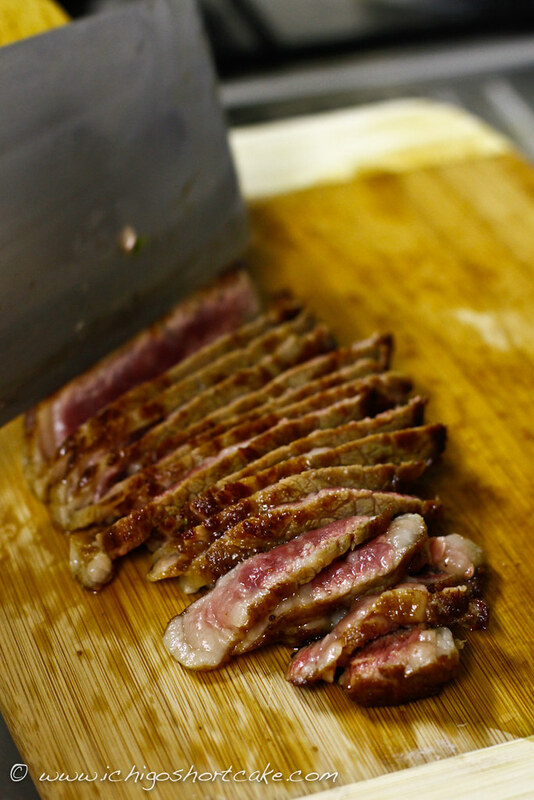 It was the first time I had wagyu (Japanese marbled beef) and I fell hopelessly in love. It was definitely love at first taste. I wanted to have the whole thing to myself but unfortunately, it was over $200 a steak so everyone just got a small taste. I couldn’t eat beef for ages when I got back to Australia. The steaks weren’t bad here but it just wasn’t the same. None of the steaks here had that perfect melt-in-the-mouth texture and lovely fragrance from the scorched fat content. I didn’t even have to chew! Time has since passed and the memory of wagyu started fading. I had proper wagyu twice in Japan but they weren’t as high grade. It wasn’t until Christmas when my family friend Lin and his parents brought over a few good grade wagyu steaks that my fond memories of them resurfaced. Ahh, that was so indulgent I felt it was almost a sin. At $99 a kilo from Prahran market I believe one steak was, the price was almost a sin too! Each steak was around 250g and we ate 2 steaks amongst 10 people with a table full of other dishes. The wagyu was by far the most popular one. 3. 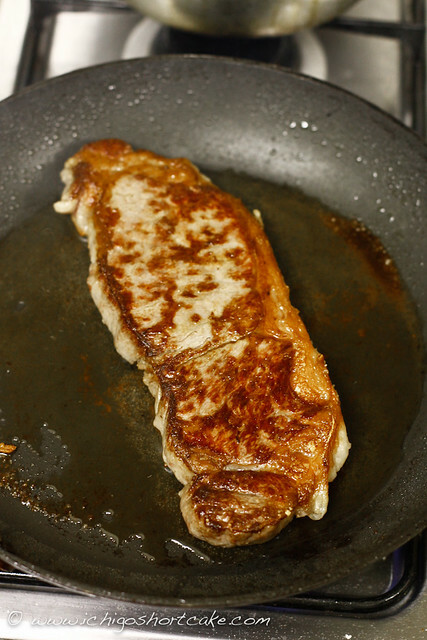 Place steak on pan and cook until slightly golden brown on one side and then flip, only cook it for 2-3 minutes until the outside is slightly coloured as you want to retain the oils inside and keep it at rare. 4. You can put a lid on the pan (like we did) after the steak is turned so the heat is even, but it’s not essential. 5. Cut into strips and serve immediately. 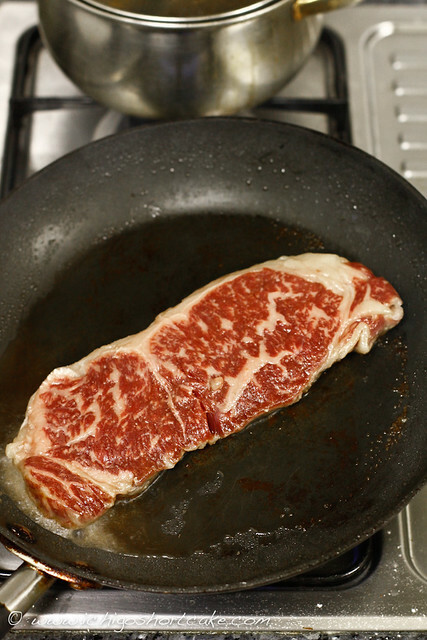 Note: According to Yuye, wagyu needs to be cooked on lower heat so all the fats in the middle is melted. Our wagyu steak was cooked on high heat but still tasted awesome so I guess you can do it either way. The ones we had were quite rare inside, if you want it more cooked, have the heat on lower and leave the steak on the heat for longer so it’s more cooked through. Lin brought over steaks that were $99 a kilo (Prahran Market) and $69 a kilo (Victoria Market), I believe the one shown here was the $69 one but they really looked and tasted quite similar. I found the $69 steak had a little bit more sinew but really didn’t make much difference taste wise so maybe go for the cheaper option if you can find it. Question time: Have you ever had wagyu? How was it cooked and how did it compare to normal steaks? Awww you should really convert 😛 it's so awesome! That is such a beautiful steak. Oh the marbling! My grandfather is a steak fanatic, but alas he will never get to try this as he likes his steaks well done and wagyu should never be cooked past medium rare. 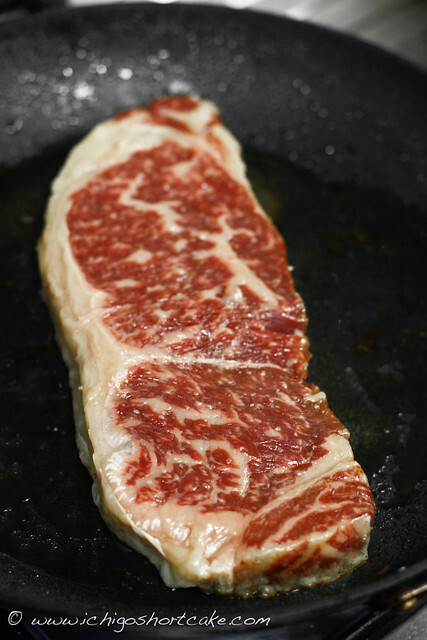 I've never tried wagyu steak but would love to; at that price I may have to wait for a while! I've only ever seen it on a menu once in Toronto and that was at the top of the CN Tower Restaurant, I believe it was $400, but that was a couple of years ago. I don't think they sold many if them since it is no longer on their menu. Yum, Wagyu! I first tried it at The Cut in Sydney, served with jus and it cost a pretty penny. Never tried cooking it though! Such tasty meat isn't it? We get grade 7 wagu at our markets for $56 kg, usually porterhouse cut, and it's lovely. We got some steaks the other day at $10 each, and the butcher asked if it was a special occasion, we said they were just for steak sangas at lunchtime. He nearly fell over, but I said it was better value than a McDonalds meal, and teamed with home grown tomatoes…. Sublime! @Deanna, I totally agree, wagyu can't be enjoyed at well done. In fact, I don't believe in any steaks well done. I just had one today and it was terrible! @The InTolerant Chef, that's quite a good price! I agree, having good steaks at home costs about the same as fast food, but it's so much tastier and healthier too!